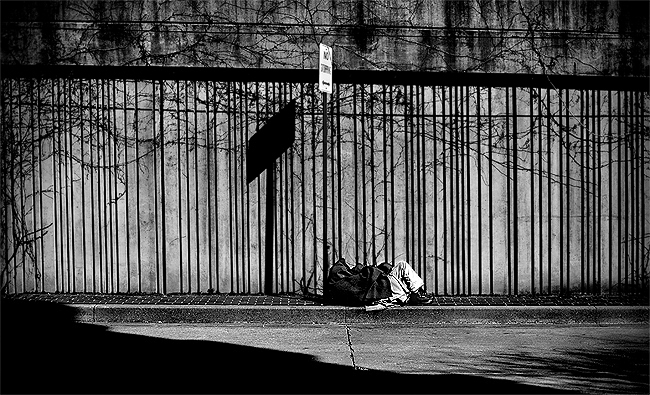 "Finding warmth in the sun on the 100 block of North Frederick St. in downtown Baltimore City, a homeless man lays on the sidewalk as darkness encroaches his position, Wednesday, Feb. 25, 2009." One of my favorite things to do is take street photos. There is so much that we overlook on a daily basis and there are so many stories on the street. I am easily inspired by the uninspiring, especially in Baltimore City. I see so many fascinating people, faces that I just wish I could interact with and learn more about. It's just so frustrating that this city is so dangerous. The drugs, the violence. It's a shame my access to this city is pretty much non-existent because I would love nothing more than to document the city streets of Baltimore. Moving on, I shot the above photo for numerous reasons when I had to head downtown earlier this week. My eye was immediately drawn to the technical and aesthetic aspects of the scenery when I first walked pass this gentleman. I loved the textures; the light, the lines, and tonal range. Not to mention, there was a human element to complete the frame. When I passed him the first time on the 100 block of North Frederick St., he was sitting facing across the street. But I didn't have my camera - which was beyond me. Roughly 30 minutes later, I walked by him again on my way back to my car. He had moved down the sidewalk to stay with the warmth of the light, sun. Already kicking myself for not having my camera, I continued on my way to my car and got my camera. I couldn't not shoot a couple frames. When I returned, he was then laying down against the "No Stopping" sign. While in my mind I was thinking that it didn’t read the same as before and it may be hard to read, I still shot. Something I was feeling drew me to this environment. There was something beyond the quick speed graphic; there was more meaning on symbiotic level. First off, I should mention that homeless can easily be taken advantage of, but given the climate of today's global economy I feel there is more of an appeal to this type of photograph. Many people fear being this man right now, out on the streets without a job, unable to meet deadlines of major payments and struggling to afford their homes. That's the current life - the tough financial situations, bankruptcy and job cuts. I obviously shot this in color, but saw the environment in a desaturated light to give the frame a cold, somber mood that it was. Everything sort of came together when I looked at the frame on the back of my camera. The darkness of cold shadows encroaching back as he attempted to stay warm. The rustic corrosion of the block which could speak of his evaporating energy of struggling to survive on the cold streets. More obviously, the "No Stopping" sign, which he obviously could careless about representing his will and strength to do anything he can to stay warm and survive. Alas, the most predominantly in my eyes, the lines of block representing prison bars - a prison - that he cannot escape. Whether or not this metaphorical prison is the weather or the depression of his life situation - trying to survive the best he can - it spoke to me. It’s rough out there now. It’s not even the first quarter and newspapers are still dissolving like sugar in a cup of hot tea. The Rocky Mountain News has gone to bed for good just this week. It’s depressing. The job market all over is weak, the stock market is down and foreclosures are at an all time high. This image is nothing more than reality of the United States in its current situation. There's a lot of poetry in that entry, awesome job with the picture. I hope that these kind of pictures, sensitive one will not be only use to promote many of our blogs or sites but really for awareness purposes. Let us not use and just enjoy watching them for fun.